I have a few food go-tos when hosting, and this dessert recipe is one of them. These cream pastry cups are refreshing and light, yet decadent–perfect for spring and summer. It also takes no more than 10 minutes to make, but no one would ever know! In a medium bowl, whip with an electric mixer or by hand (if you have serious guns!) the cream, zest, juice, honey and salt until stiff peaks form–be sure not to over whip and become clumpy. Drop a dollop of whipped cream in the already thawed cups. 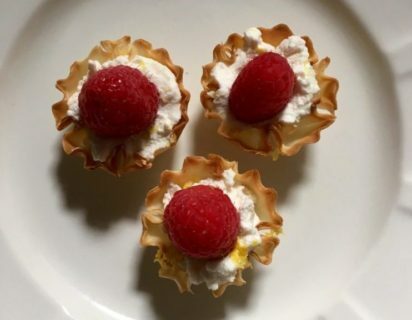 Garnish lightly with lemon zest and top with a raspberry. Enjoy!